Pac ‘n’ Wrap’s polypropylene strapping is available in a choice of job-matched widths, thickness and tensiles. It is a fraction of the cost and a proven effective alternative to steel or nylon strapping. Aside from being economical, plastic strapping has the ability to expand when necessary or contain shrinking and setting loads. With your choice of closure method, you will receive strapping efficiency that improves performance and decreases job time and labor costs. Polyester is the most rigid of all strapping materials. It elongates significantly less than polypropylene and retains tension over a longer period. 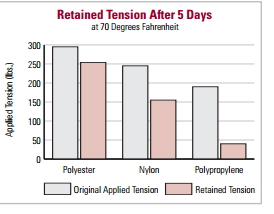 Polyester is nick resistant and can be sealed with seals, heat or friction welds. Frequently used on heavy duty loads that need high initial tension along with high retained tension. Common applications are empty cans and bottles, lumber, and heavy, rigid palletizing. Polyester is available in both machine grade and hand grade and is easy to dispose of and to recycle.